Here we go again. The same rules apply. Hop on over to Mike's blog to see the rest of the match-ups and entries!! We've got a little bit of everything: adult, NA, YA, and MG! This round last until June 17th at 8 pm. No commenting on your own entries until Wednesday. If you see something wrong with your entry such as a word that should have been italicized but isn't, or something else, first try to Tweet me @Michelle4Laughs (this is the best option). If you don't have a Twitter, comment on your entry telling me the mistake (but this way will be slower as I won't be checking the comments as much as Twitter, and also because your comment may be lost in a flood of judges' votes). Also, we tried our hardest to make the match-ups as fair as possible and against as similar stories as possible. But, obviously, this is impossible to do perfectly and some match-ups may seen very random (they're not). We apologize for this but it's an evil of the system. Kombatants should comment on 6 other match-ups to help share the love around! Wait until after one of us hosts comments on each entry first and reply to that comment to cast your votes :) Try making your votes objective instead of subjective (but if you really love an entry subjectively, don't even feel bad about saying it was a subjective vote - subjectivity rules!). And judges: seriously, thank you so, SO much for doing this. It's a very tough job (just wait until you start doing it!) and isn't for the faint-hearted. Try not to comment until after one of us hosts have made the first comment! NOW THE FUN BEGINS!!! GO GO GO!!! 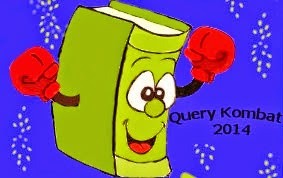 We'll be Tweeting under #QueryKombat!